The Canada Geese are by far the most numerous waterfowl on the lake. They can be a bit of a nuisance and are the reason that most people have fences on the lakefront. "Whitey," as we call her, is a white goose. We aren't sure what type of goose she is. At first, we thought she was a snow goose, but the snow goose has a much different shape to its beak. Whitey is more domesticated than the other geese and we speculate that she may have been a domestic goose that is now out in the wild. It's hard to call her wild. She seems to enjoy handouts more than the wild geese. She notices when the first light goes on in the morning and appears just in case we have something. She'll get up on the dock and attempt to join in a snack or a conversation. She'll get involved in our yard work. Some neighbors have told us that in the past she's laid eggs and had goslings. There don't appear to be any this year. We have seen her mating with the Canada geese. So that brings up the question as to why there are some geese with white heads but mostly Canada Goose markings. We've read that Canada Geese can interbreed with Snow Geese and produce goslings with similar markings. We don't know if these are Whitey's offspring. 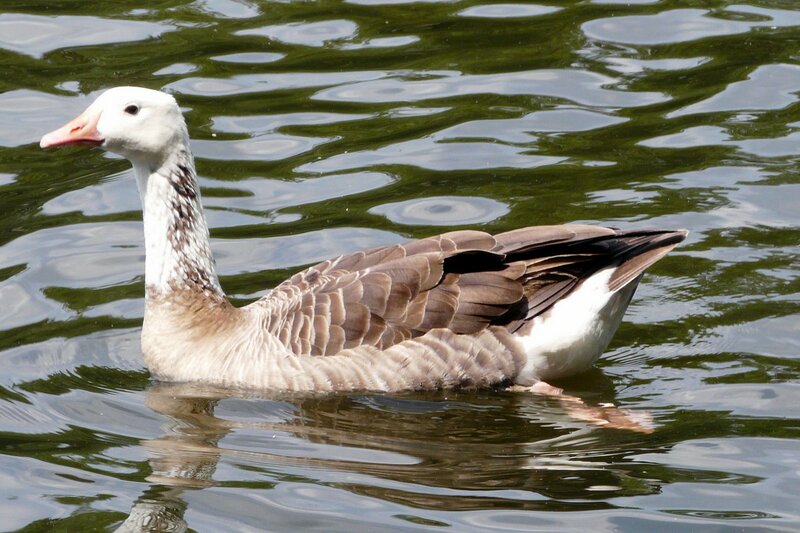 Below is another goose with unusual markings (at least to us). The goose above is the same size as the Canada Goose. The one below is noticeably larger, but hangs out with Whitey often as well as the Canada Geese. We really don't know what is going on. If you do, leave a comment (by clicking on the word comments below as in "0 comments" or "1 comment"). Hi, I am doing a project for school on canadian geese and was wondering if I could use your picture in it. Yes, you may use the picture for a school report.